This award winning product comes ready to use and is used to safely clean leather, as well as fabrics, carpets, vinyl and plastics. Super Clean contains optical brighteners which bring leather and fabric back to life, leaving them looking crisp and clean. The fresh lemon fragrance in the product also leaves your interior smelling as clean as it looks. To use, spray on to surface and leave for approximately 2 minutes to soak in and loosen the grime, agitate with a brush or interior sponge if necessary. Then use a wet, lint free cloth to scrub the surface, rinsing the cloth frequently until the soiling is removed. Then leave to dry. 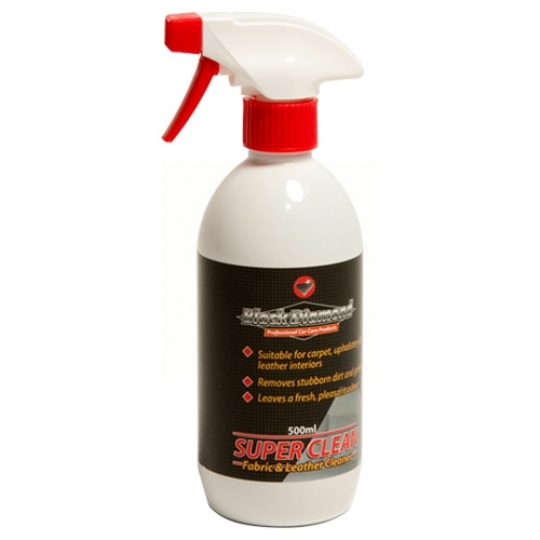 One customer E-mailed in to say "My Superclean arrived last week and we are highly delighted with the product, it does exactly what it says. My daughter’s stained upholstery seats now look like new."